One of the favourite stops on a garden tour is under the pergola covered by the exotic bananadella vine. Over the long winter months we have been watching the beautiful pink flowers transform into long green fruits, which are now ripening at last. 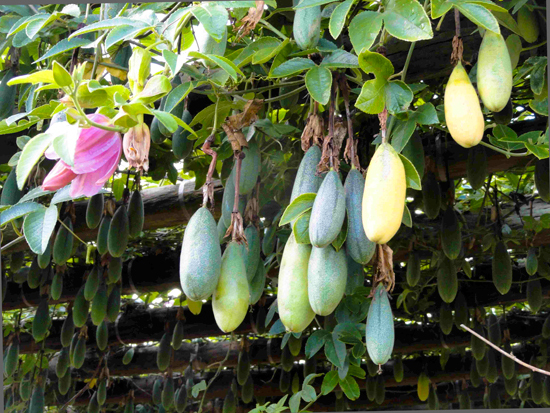 On the outside the yellow fruits may look like a banana, but inside the pips are typical of a granadilla. It’s highly unusual in looks, and as for the taste? Gundula tells us it’s…exotic! Come and see for yourself one day. Not to be nitpicky but you spell the name of the vine differently throughout your post. It is ‘Banandadella’ in the title and ‘Bananadella’ in the first sentence. I just bring this up because I wanted to see if it can grow in my region and the internet seemed to come up short with either spelling. 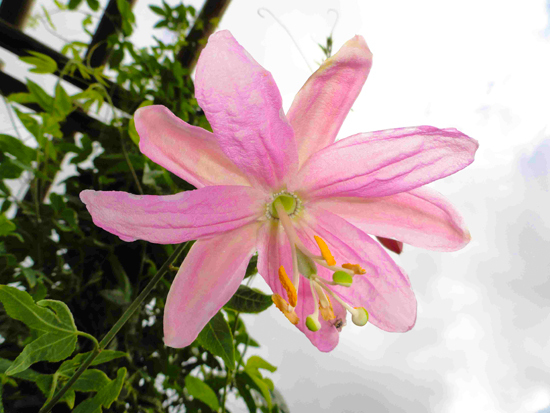 Do you perhaps know of any other names for this beautiful plant? Babylonstoren is looking really wonderful. Thanks for sharing it with the internet! Thanks, Tony! We’ll make those edits immediately. It is such a beautiful plant but it’s currently on the invasive list, so you have to be careful when planting it in summer rainfall areas. For that reason we do not have plants available and also don’t know of any growers that do either.